“Smile!” “Click!” “Oh, you look beautiful!” These comments were heard a lot on Monday March 4th, the day the John M Parrott Centre hosted their 3rd annual Glamour Day Photo Program. Organized by the activation team, the day involves transforming not only MacDonald Hall but many of the residents, in order to capture their beauty, both inside and out. This is most definitely a team effort. PSW staff assist residents with their special wardrobe for the day. Thanks to the home's hairdresser, Jeannie, who volunteers her time, and a community volunteer hairdresser, Dawn, the residents have their hair styled, before moving on to activity staff who apply a personal touch of make-up. 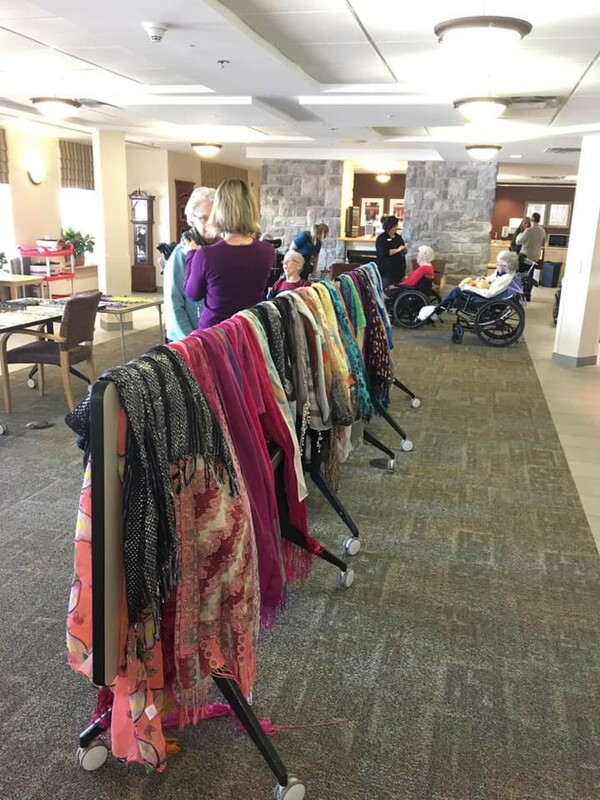 From there, a resident receives assistance from the Resident Services Coordinator, Karen, to be outfitted with coordinating glamour accessories, such as decorative scarves, necklaces, clip-on earrings or brooches. After a final glance in the mirror and a smile of approval from the resident they move to the Chapel area where a paid photographer, Joanne Harrington (Three Bees Photography from Brighton, ON) expertly photographs captivating photos of each resident. "We further endeavor to capture photos of couples or siblings, even family members if they are interested in participating," says Angela Malcolm, Director of Long Term Care Services at the home. "With many hands, this day has allowed as many as 106 residents to experience this day of pampering. The enchantment and excitement of this program has had long lasting effects for all involved, so much so that we are planning another photo shoot for residents and their families this fall!" A few weeks after the program, the proof of a successful Glamour Day comes in the form of a hand delivered, framed, 4x6 photo for each individual resident at no cost. Additional proofs are also provided to family members via email for printing. Some of the great photos captured last March are below.